The Fab Four: What we have been up to! Bry has been working hard at RC WILLEY and going on lots of business trips. He has gone to Reno, Vegas, and soon Boise. He loves to play with Mayley and makes her laugh the most! He is also the best husband ever! He is a hard worker on the weekends. He is excited for spring to come so we can make our yard look super nice and pretty. He is about the funniest person I know! We found out that we are going to have another baby in July!! He is rooting for a boy when we find out what we are having next month. He still thinks we need to name the baby boy BRUCE. Funny story is that there is a little boy that is 6 years old that lives in our ward named Bruce. 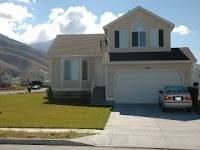 We just bought a new house in Tooele! Here is the picture of our pretty house! I, Brianne like to stay at home and take care of my darling princess baby girl Mayley. I have been having lunch with friends once a week. I can't wait for the spring and summer to come so we can go swimming, camping, hiking, and going outside to play. I was called to work in the primary presidency in my ward. It's been keeping me super busy! I love working with children!